How Can I View More Statistics For My Quiz? Learn to use our advanced reporting capabilities with this help documentation. 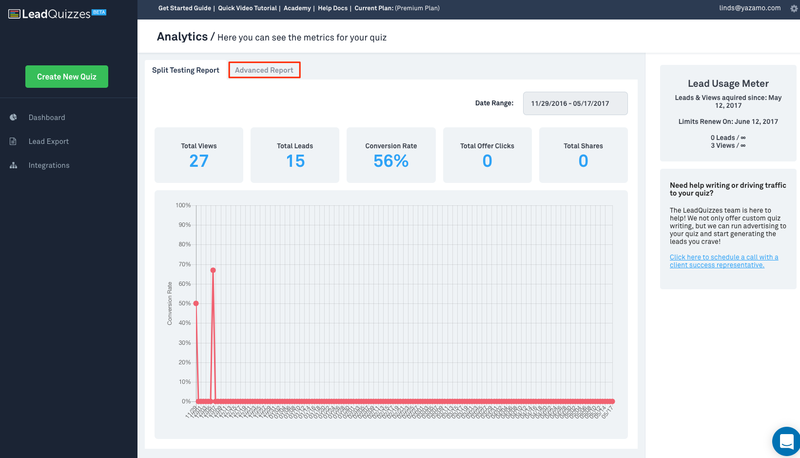 Before you can see advanced reporting, you will first need a quiz published in LeadQuizzes that has had at least one quiz view. To see if your quiz has any traffic login to LeadQuizzes and look at the "Dashboard" and the quiz you are wanting to view. 2. Once you've determined that your quiz has traffic going to it, click on the "graph" symbol next to the quiz. 3. 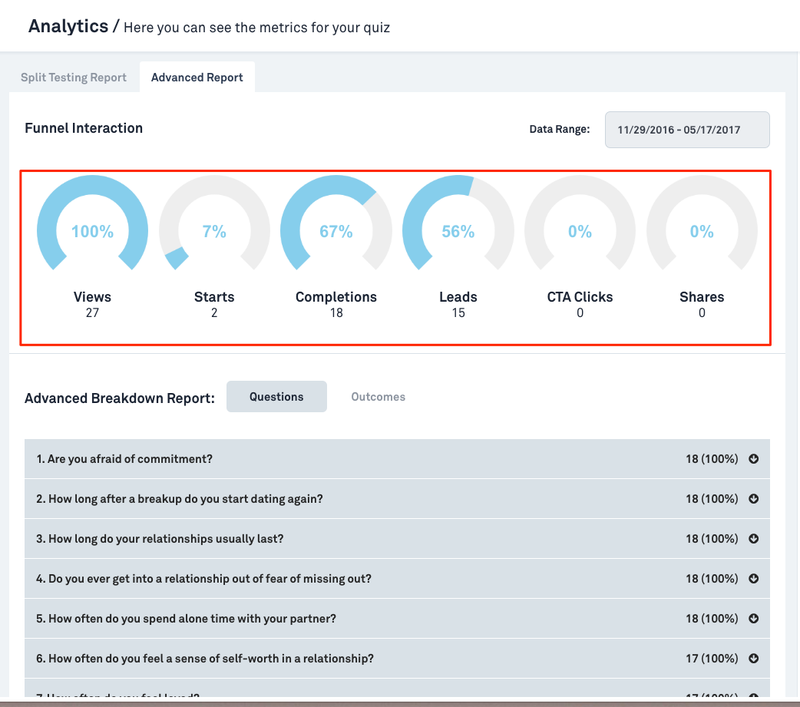 You will then be taken to the "Analytics" dashboard where you will see your "Split Testing Report" as well as "Advanced Report"
4. 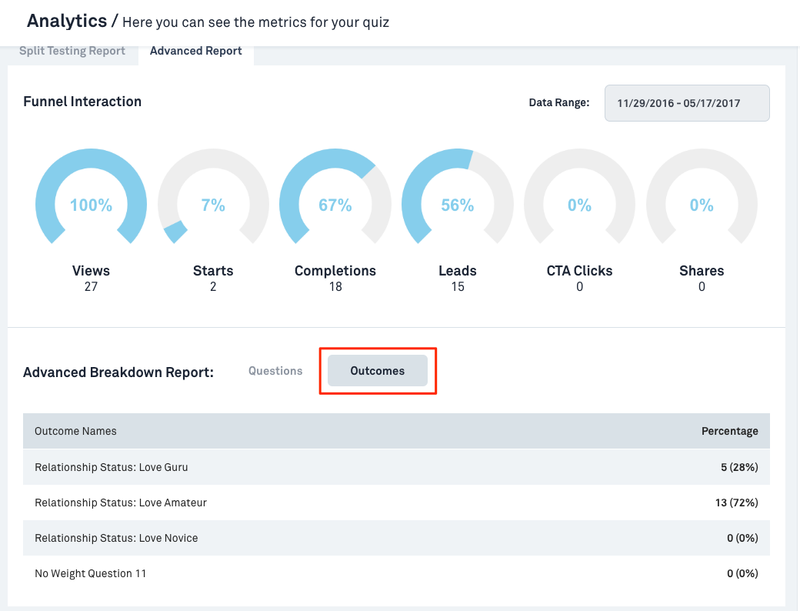 Click "Advanced Report" at the top and you will see a complete breakdown of how people interact with your quiz. 6. How many people viewed, started, finished, opted in, clicked on your offer and shared your quiz, as well as the percentage of people who viewed your quiz and did these things. 7. Below this you have the option to see a breakdown of your questions and answers or your outcomes. In the default mode you will see the questions, including how many people answered that question and then if you click the little arrow next to the percentage the breakdown of answers given. 8. To see this for outcomes change the view to outcomes by clicking "Outcomes" next to "Advanced Breakdown Report"
9. You will see a breakdown of all of the outcomes on this page.